I’ve given myself a goal: a ~2,000 word story before the next Houston Scien—you know, from now on, I’m just going to abbreviate it. HSFFW. I plan on sticking around for the writing critique portion of the next HSFFW meetup, and I’ll need something to pass around. The meeting is scheduled for September 9th, just about two weeks from today. An experienced writer could surely complete a polished ~2,000 word story in a matter of hours or days. I’m not that experienced. What have I been doing with my time, you ask? Surely I’ve been writing, working on the story, working on the novel I have in production? Nope. Fantasy Football, baby. I’ve been completely distracted for the past week with draft lists, PPR rosters, pre-season reports and mock draft after mock draft. I think I’ve run two dozen or more mocks this week. That’s not as bad as it may sound. Most of the mock drafts that I’ve run have been automated; I make my picks manually, but my “opponents” teams are auto-picked. The whole 18-player team drafts in mere minutes. The live mock drafts take anywhere from 60–90 minutes or more, and I’ve only run six or eight of those this week. 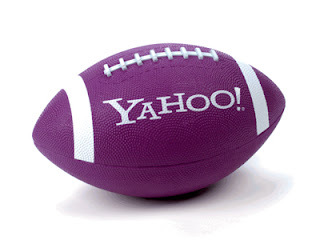 I’m in a Yahoo! league with some friends, so I won’t go into my pre-draft strategy right here because those schlubs would totally use it against me. Suffice to say, they’re dead. They are all completely screwed this year. When I run my mock results though rating tools, I get predictions like “You have a 90% chance to make the playoffs!” or “Despite looking weak at QB/RB/WR/whatever, we think you’ll have a great season if you pay attention to the waiver wire. 85% chance to make the playoffs!” Last night I ran a live mock draft in a 12-owner league and was told my team had a 99% chance to make the playoffs. I. Kid. You. Not. So, to all my friends in the Fantasy Sports Geeks league… what did we say the dues were? Can we triple it? You can just hand me that oversized check now. No need to wait. Our draft takes place next Wednesday night, the 28th. Writing resumes next Thursday.